Seasons do change with the scenery; especially when the scenery of London becomes that of the European Technology Platform on Smart Systems Integration (EPoSS) Annual Forum which took place in Barcelona at the beginning of October. 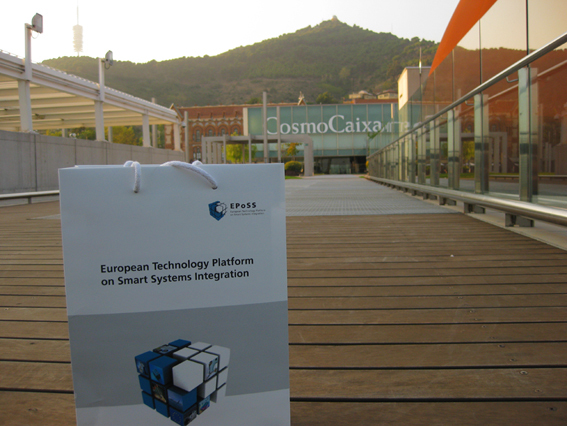 Weft-lab's summer was extended by a few more days while we gave presentations at both the annual forum and the proposers' day, all held at the impressive Cosmo Caixa Science Museum. We hope we gave the (technically & commercially impressive - Siemens, Alcatel, Fiat, Uppsala, Texas Instruments..) audience an alternative socio-design perspective on the possibilities for user-orientated smart systems, based on our work on wearable technologies. We look forward to the possibility of some weft-lab involvement in future collaborative European funding bids. Thanks to David Topham of Arts & Science for collaboration on the presentation and suggesting we submit a presentation in the first instance; and Marc Desmulliez of Heriot Watt University for the contribution to the proposers' day pitch.